With the addition of tubing inserts to the StockCap line of caps and plugs, a manufacture of tubing was quickly able to fill a need on a project involving a signpost. The tubing manufacture was already a client of StockCap when they learned of the addition of the new tubing insert line. A tube insert was perfect for the signpost project and both round tubing inserts and square tubing inserts were available, exactly what was required. The knowledge that an existing supplier carried the exact items required meant skipping extensive credit approval processes and getting right to the purchase. StockCap expanded their product offering with round, square, and rectangular tubing inserts made from low-density polyethylene. This durable material provides tough protection from general wear and tear and harsh environments. All styles feature a curved edge that makes it easy to slide over surfaces such as carpet or concrete. Patio furniture is a good example of the use of tubing inserts. Tubing inserts are also found in metal furniture, office furniture, exercise equipment and now, signposts. Black is the standard color. Other colors can be manufactured upon request. 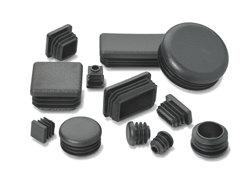 Tubing inserts from StockCap include many sizes. A quick review of the StockCap website or catalog reveals full details of the round, square and rectangular tubing inserts including a variety of dimensions. Tubing inserts are also available in the StockCap online store.